The other night I had a craving for chocolate (what else is new? ), but I didn’t feel like going too heavy on the chocolate – just a hint of it would satisfy my cravings. Chocolate chip cookies were the answer of course. 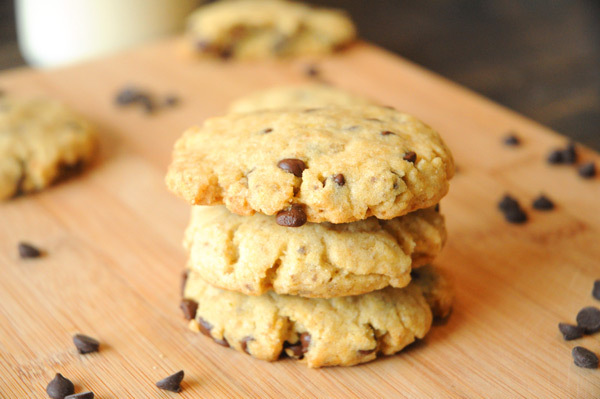 Nothing is better than a homemade, fresh-from-the-oven chocolate chip cookie. I’ve made quite a few vegan chocolate chip cookies, and they would either come out too crispy and flat, or too cake-like. Never anything right in the middle. With a bit of experimentation, I landed on this recipe. And it’s been my go-to recipe every since. Everyone that eats these cookies loves them, and they can’t even tell that they’re vegan! 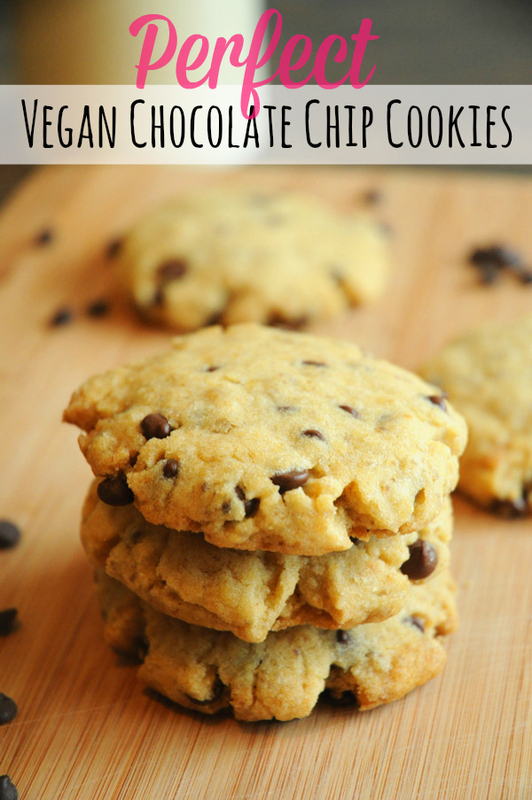 The most delicious vegan chocolate chips cookies I've ever had. They're perfect! Preheat oven to 350F and line a baking sheet with a baking mat or parchment paper. In a small bowl, mix together the ground flax seed + water for the flax egg, and set aside to thicken (at least 5 minutes). Add the brown sugar and butter to a large bowl and using an electric mixer, beat them together until creamy. Beat in the flax egg, vanilla, baking soda and salt. Beat in the flour, ¼ cup at a time, and then fold in the chocolate chips. Form the dough into small balls and place on your prepared baking sheet. Flatten slightly with the palm of your hand. Bake for 12-14 minutes. Allow to cool for at least 10 minutes before eating.